Congratulations! You converted a cold lead into a hot prospect and now have an upcoming inside sales meeting with them on the books. But how are you going to move your target through the sales pipeline and bring them closer to becoming a new customer? Below are a few key insights we’ve learned from nearly twenty years of inside sales experience that will help you close the deal. First, make sure that the person you’ll be speaking with is someone who can make a buying decision. You don’t want to sink valuable time into a meeting that ultimately won’t end up going anywhere. To promote time efficiency, create a call agenda to keep your sales conversation on track and you in control of the conversation. Scripts are helpful, but don’t rely on them word for word in every single meeting. The best sales pros customize their pitches. Research your prospect and the organization they are representing. Understand their business and the challenges they may be facing from industry competitors. Identify and be sure to call out the specific ways that your product or service will help them reach their goals. Expect to be quizzed. Think of common questions and rejections that may arise, and write out talking points so you won’t be caught off-guard. Practice these responses until they’re memorized and second nature. Start the meeting on the right foot with a strong greeting. Introduce yourself and your business, maintain confidence, and keep the tone of the conversation positive and upbeat. Everyone knows that person who likes to jabber on and on. Except, when was the last time you asked them out to join you for a meal? Probably not for a while! You avoid them as much as possible, because it’s no fun when someone dominates a conversation. Pretend like you’re having a chat with a friend at the coffee shop. Studies have shown that top sales reps use their ears much more than their mouths – a 43-to-57 talk-to-listen ratio, to be exact. A good back-and-forth dialogue is critical to a successful sales deal – reps who let prospects talk more increase their close rate by 11%. Why does the B2B inside sales profession exist? If you distill this question down to its simplest form, the value you provide is delivering a solution to fix a problem. So before you start talking about your product, no matter how impressive it might be, you need to take a different approach. You first need to understand your prospect’s problems and pain points. The best way to do that? Ask questions. What keeps them up at night? This critical sales technique is simple, yet often overlooked, especially by less experienced reps. By understanding the challenges that your prospect is facing and getting them to admit they have an issue that you can fix, you’ll put yourself in the best possible position to effectively demonstrate the real value of your product. Remember, this time is crucial. Don’t spend it selling your product’s shiny features. Instead, focus on communicating the benefits that the prospect will enjoy after they sign with you. Think back to the pain points the prospect mentioned. Are they on track to miss their annual revenue target? Is their team understaffed and stressed, just keeping their head above water? Would they rather automate some functions in order to focus on other ways they can provide value to their organization? Once you start approaching the sales call this way, you’ll be able to connect on a deeper level. Sell the benefits, not the product. Features are great but not the end game. Don’t make your marketing message all about your product. Focus on education instead of promotion. Knowing you have an upcoming sales call can be pretty stressful. It’s hard enough just to land a meeting, so it’s important that you make the most of the opportunity. These tips are not only guaranteed to ease tension, but will also go a long way in helping you close more deals. Want to smash your sales targets, but not sure where to start? 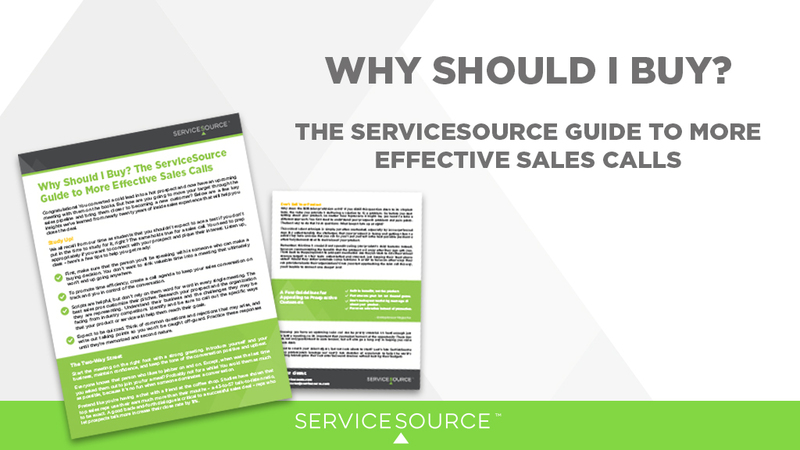 Learn how ServiceSource inside sales professionals leverage our nearly two decades of experience to help the world’s leading brands grow their customer base and revenue without busting their budgets.